i like them, they would also fit nicely for Renaissance style ships or ship of lines for battle of trafalgar. Man these look AWESOME! 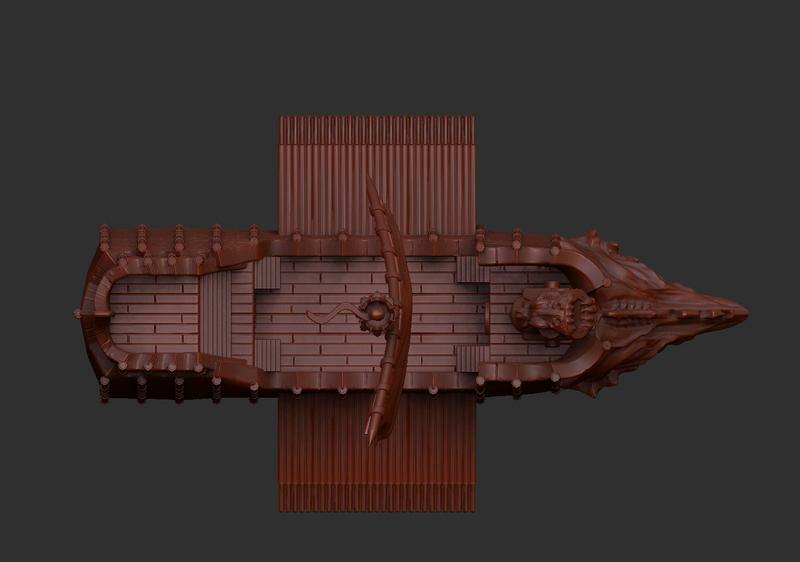 I would encourage you to give it a go even if Uncharted Seas is supposedly coming back; Uncharted Seas ships were always too large to do proper fleet battles, and these look like they would allow for some great fantasy versions of the Spanish Armada or Lepanto. I can’t but agree with the above: bigger fleets, smaller minis. Uncharted Seas had those huge, empty decks that made me wonder what was supposed to go on them. And above a certain scale you’re just not really playing a naval war game anymore - it’s something else. 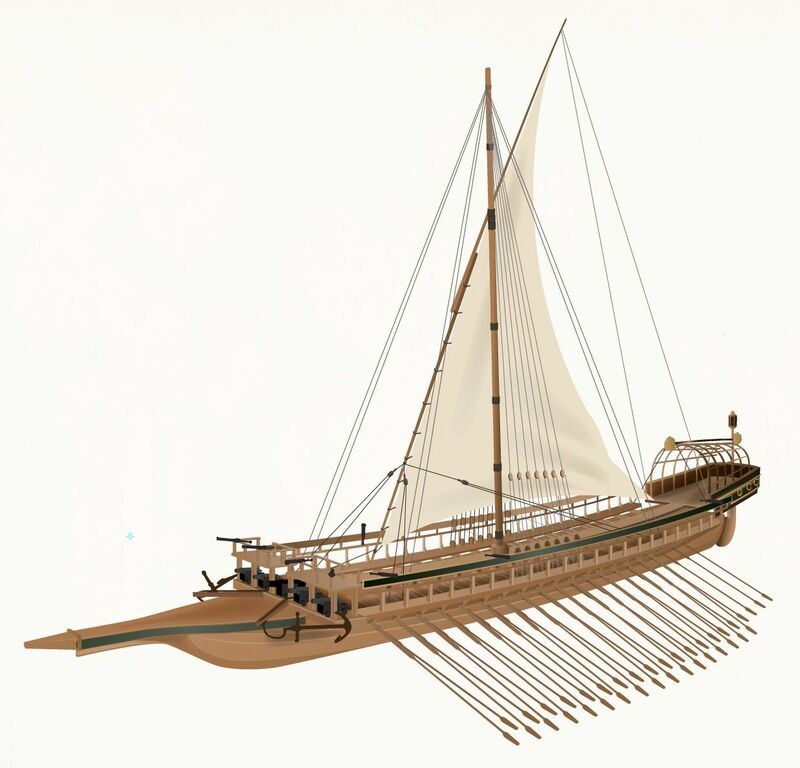 A modest suggestion: War galleys of all kinds, to go with the Fantasy Renaissance. Oh, my goodness, yes. This is one I’ll be following with great interest! 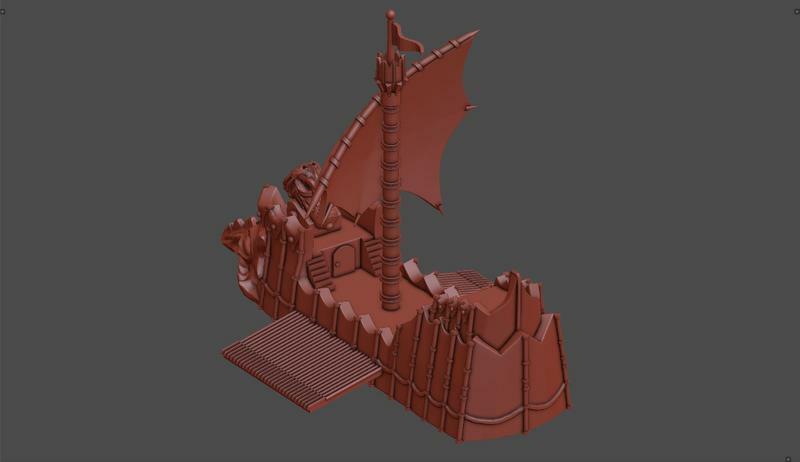 Some work in progress shots of a test Dark Alliance galley. Should the oar banks extend further to the fore of the ship? I don't think the oars should go further forward without also going further aft too. At the moment they have a nice balance between that looks pleasing. Too far either way and I think it would all look a bit "wonky". I agree it would be better to extend the oar bank in both directions. By one 'section' fore and 1.5 'sections' aft maybe? I agree. 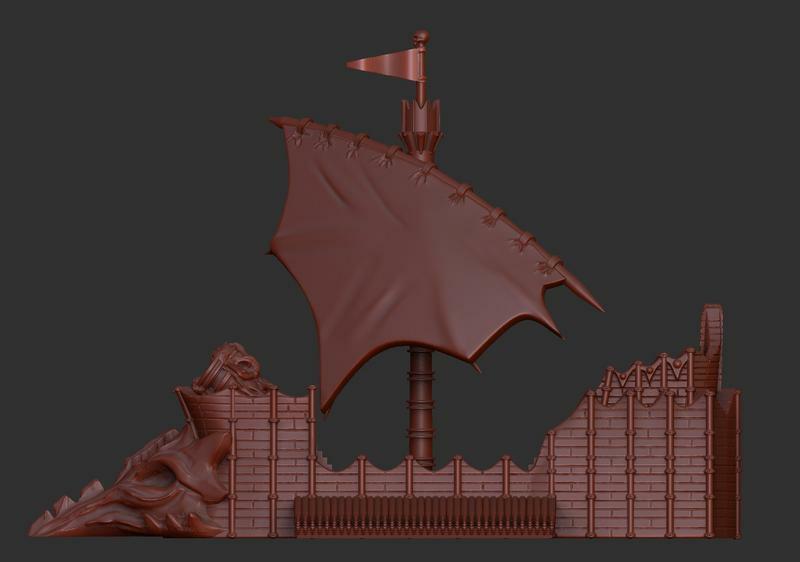 Also the sail and the yardarm look super tiny compared to the hull and the mast. The sail could be bigger, yeah, perhaps extend one or two rope coil "points" down the mast and a similar amount wider. The yard seems fine to me, matching with the mast to the old Man O'War style and size. One thing though - if the galley is going to have a lateen sail (triangular, with the yard at an angle like that) the yard should run more along a fore and aft orientation, rather than flat across the hull. If the sail is square, with the yard perpendicular to the mast, then flat across would be fine. 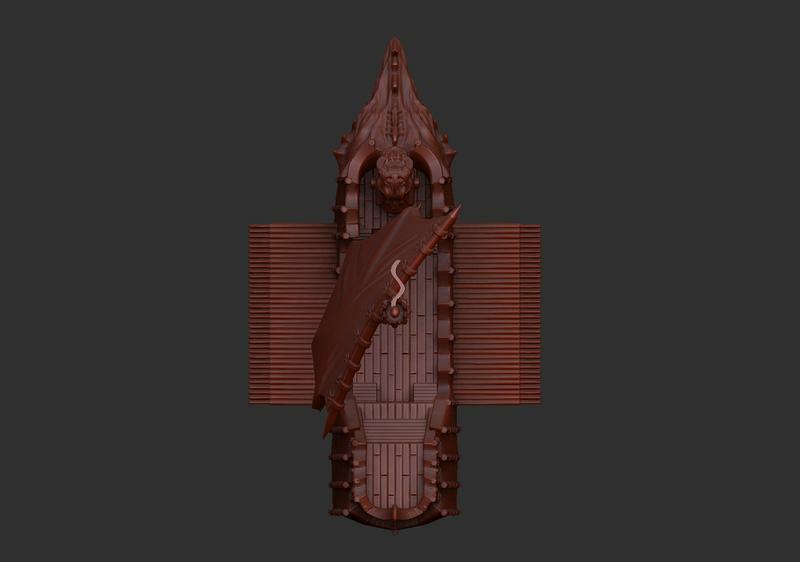 I realise the mast will be separate, but displaying it oriented correctly would help people eye the other details better. 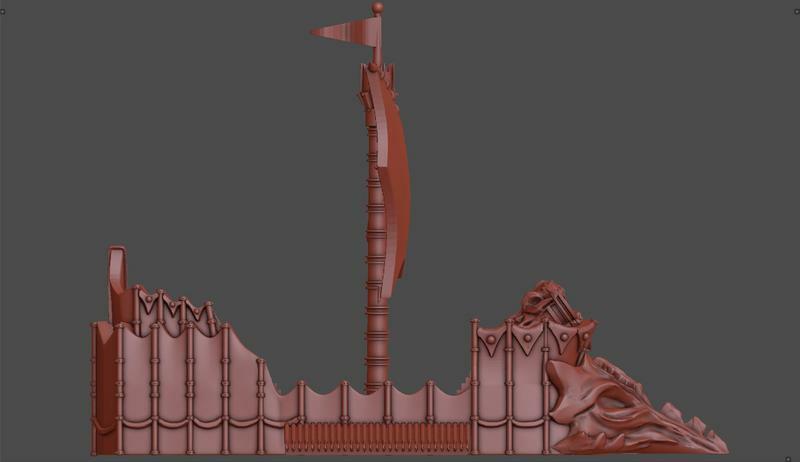 Thanks for the feedback everyone, will have the sculptor expand the oar bank. So, you can see the sail orientation in the last pic. I am thinking it should be swung around so the yard is parallel to the hull, rather than diagonal like that? I will also likely have the sail increased in size. As suggested, maybe just extend the lowermost tip down and widen accordingly? 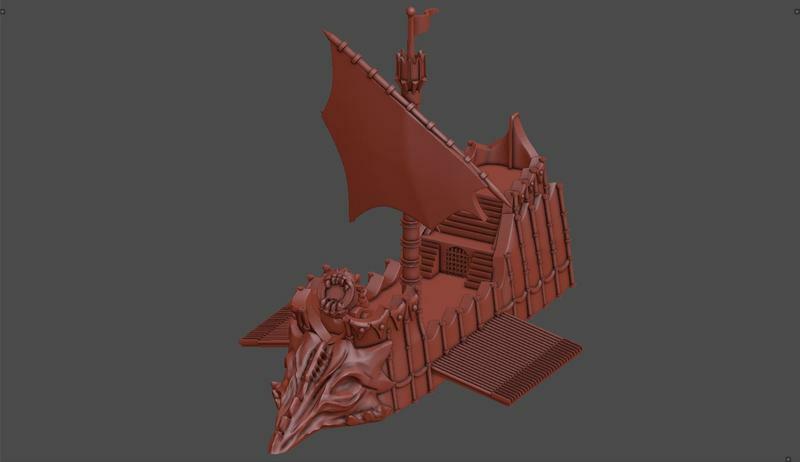 I think the only issue there is that currently the bottom of the sail is about even with the topmost structure of the hull...would it be silly to go lower? Maybe just make the mast a bit taller to compensate? So, you can see the sail orientation in the last pic. I am thinking it should be swung around so the yard is parallel to the hull, rather than diagonal like that? If you mean to have the yard flat/horizontal, right angles to the vertical mast, then I'd make a larger, squarer sail. The interesting shape is fine, but in a generally move square form. If you mean to have the yard running parallel front-to-back, then keep it angled down in a lateen form with the triangular sail, though in either case a slightly larger sail wouldn't be a bad thing. I don't think the sail getting as low as the highest structural hull point is a bad thing, just so long as the ratio of sail to ship looks right and the main fighting decks aren't getting the sail draped across them. It looks like there's enough room even with a fore and aft rig to have the sails widened/deepened without them infringing on the deck area in a bad way. OH, one more thing. A minor thing, but a thing nonetheless... The top pennant should be blowing forward, otherwise the ship is forever sailing against the wind (and going nowhere). The flags should definitely flow if not exactly, at least -mostly- towards the front of the ship. Last edited by Doomkitten on Thu Oct 12, 2017 4:27 pm, edited 1 time in total. Note how the yard runs at angles to the hull but still close in. Forward port deck to aft starboard deck would be fairly close. And about 50% larger than now shown. That would be what I’d try. Also I’d leave the planks off the outside of the hull - I could see it as plated in metal. The planking really adds a lot to design I think; I'd leave it. Sail has been enlarged, oar banks lengthened, flag on top fixed, plug point for yard arm moved to the side. 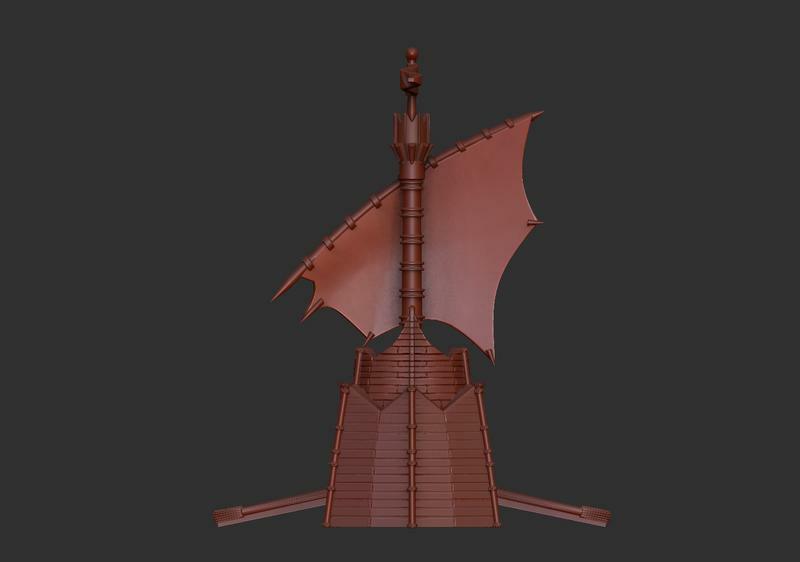 I would probably mount the sail differently than it is oriented here, but you get the idea. 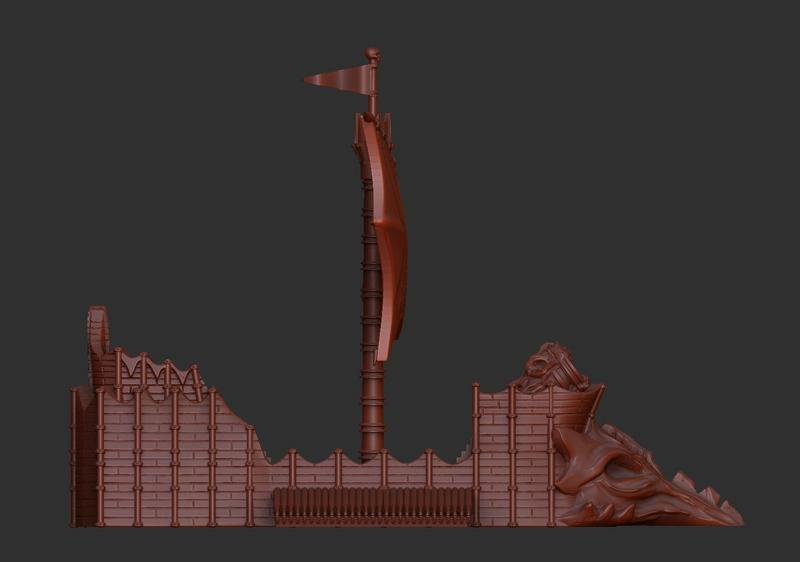 I might get it printed at this point and see how it looks in real life. Other than switching the sail so it runs from low at the front to high at the rear, I think you have a winner there.